The course is designed to help you understand how official Calls are placed in corporate sectors. This course works for both personal and professional objectives. Mechanism of making a call, qualities of a good voice and handling irate customers are explained systematically. This course gives you an insight right from introduction to telephone etiquette to common mistakes made during calls. We offer a scenario-based online course packed with whiteboard videos, interactive quizzes, programs, methods to avoid errors and alternative process to upskill your knowledge in Telephone Etiquette. 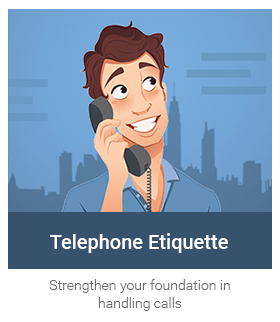 Telephone Etiquette course strengthens your foundation in just 5 exciting levels. The aim is to understand what telephone etiquette is, its importance, the difference between a casual and a telephonic conversation and finally we learn the physical use of a telephone. Learn and understand the preparations for a call, how to converse over a telephone and things to do post a call. Motifs/pictures and few practice exercises will help you with your learning. Learn the physical qualities of a good voice and the tips for creating a good image over the phone. The examples and questions helps you learn better. Learn and understand the importance of handling customers and the skills required for the same. Exercises and fun facts help you boost your learning. Understand the do's and don'ts and frequently repeated errors in telephone etiquette through practice exercises.